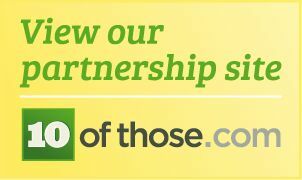 Would you like to read a series filled with excitement? 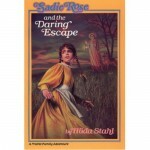 Then read the “Sadie Rose Series.” Filled with adventure, these books written by Hilda Stahl are just right for any girl who loves fun and excitement. Sadie Rose is a girl who lives in the Nebraska sand hills during the pioneer days. From having some excitement with a kidnapper to facing outlaw cattle rustlers these books are filled with suspense. I like these books because they are very exciting. I also like them because are set when the “wild west” of America was being settled. I would recommend these books for ages 9 and up. 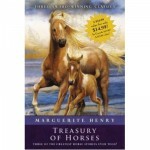 Marguerite Henry’s fantastic books about horses are perfect for anyone who loves this animal. There are a lot of good books, including: “King of the Wind”, Mustang, Wild Spirit of the West”, “Born to Trot”, and the world famous “Misty of Chincoteague”. These books are full of information about horses, and I have learned a lot from them. I love these books because they are all about horses. Also I like them because they are very exciting and full of adventure. The books Marguerite has written are for different ages, including some for younger children. * Note: I own the following books: King of the Wind, Misty of Chincoteague, Justin Morgan had a Horse, Born to Trot, Mustang, Wild Spirit of the West, White Stallion of Lipizza, and The Album of Horses. The “Sisters in Time” series are perfect books for any girl who loves history. This series covers important periods of time in American history from 1620 to 1945. From cover to cover they are crammed with adventure and excitement. 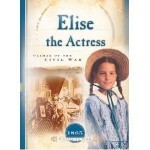 My favourite book so far is called “Elise the Actress,” which is set in Cincinnati, Ohio, at the climax of the American Civil War. Elise loves to put on plays to divert people’s minds from the gloominess of war. When she befriends a man who people call a traitor, she is forced to make an important decision that will affect her family and friends. To find out what happens you will have to read the book. I have enjoyed these books so much for two reasons: Firstly, I absolutely adore history, and these books are chock full of it. And secondly, a lot of times I find that the girls in the books are not so different than me. I highly recommend these books for any girl age 10 and over. * Note: Some of these books may deal with slightly heavy or sad topics. / There are twenty-three books in the series.